Balneário (Resort) conjures many images—as a place to bath, to have fun, as a place of arrivals and departures—and as a place that returns what we’ve discarded. After all, who never came across plastic detritus on a beach during a vacation? 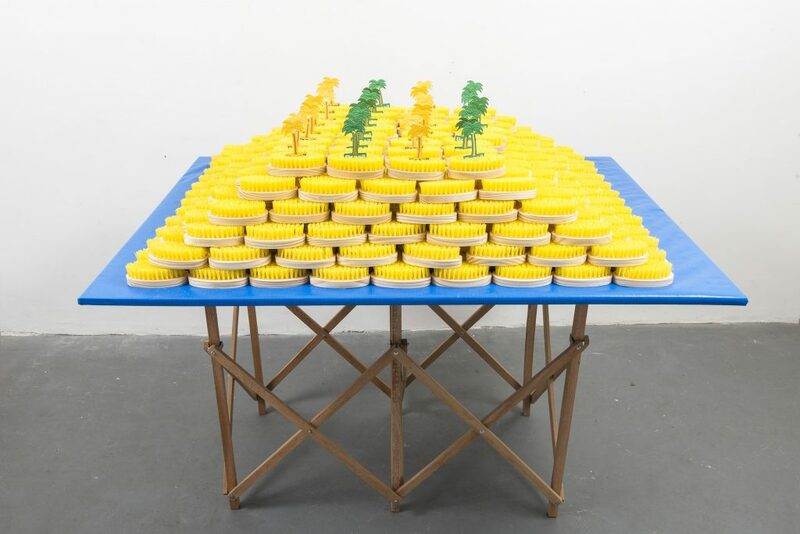 In this regard, it’s impossible to look at this exhibition by Mano Penalva (1987, Salvador, BA) that investigates the foundation of the national culture, those characteristics that make a commodity a “national product” and the circulation of found and purchased common objects and not think about issues of ecology. Coastal regions will suffer the first consequences of global warming and could disappear from the planet, and it is also there that objects that may have circulated for days, years or decades end up. Hearing the sound of the sea that echoes through space from the video “Atlântico” (the only one among sculptures, paintings and wall pieces), I reflect that the “balneário” can be a place of both fantasy and nightmare. In “Atlântico,” the oscillating camera seems to follow the waves and acts as a sort of porthole from where we contemplate the wild blue yonder of the sea—this liquid mass that surrounds the continents, the symbol of our anxieties, that brings and carries things in the world. Sea and sand usually inhabit the idea of summer. 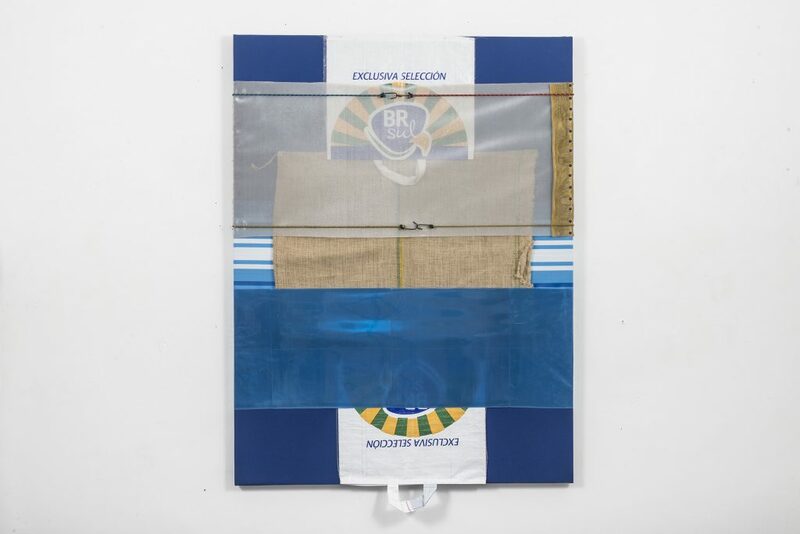 A set of works, perhaps motivated by Penalva’s adolescence in Salvador, activate summer and leisure memories: the nylon weave of a beach chair involving plastic espadas-de-são-jorge, a Brazilian plant (“Tramas” series), the wooden-balls curtain (“Tudo Passa” from the “Tempos” series), the rocking chair with shredded straw seat (“Tempos” series), the mountain of yellow brushes that seems to imitate the dunes of the beautiful beaches that surround the Beach Park in Ceará (a famous resort in the northeast of Brazil) with its lanky coconut trees. 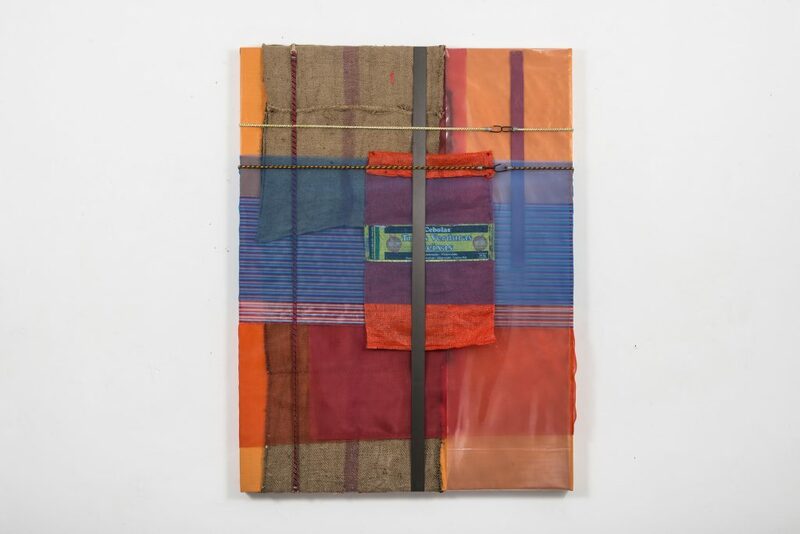 Bidding farewell to summer memories, another group of works relates to displacements—more specifically the transport packaging including nets, plastic fabrics, jute bags, ropes, rubber bands and hooks. Wrappings telling us things about their identity but not what they carried or would carry someday. While the summer evocations carry a more idyllic sense of the title, these suggest a movement bias of goods, the sea-to-land relationship, the arrival and departure of things, of uses and disposals. 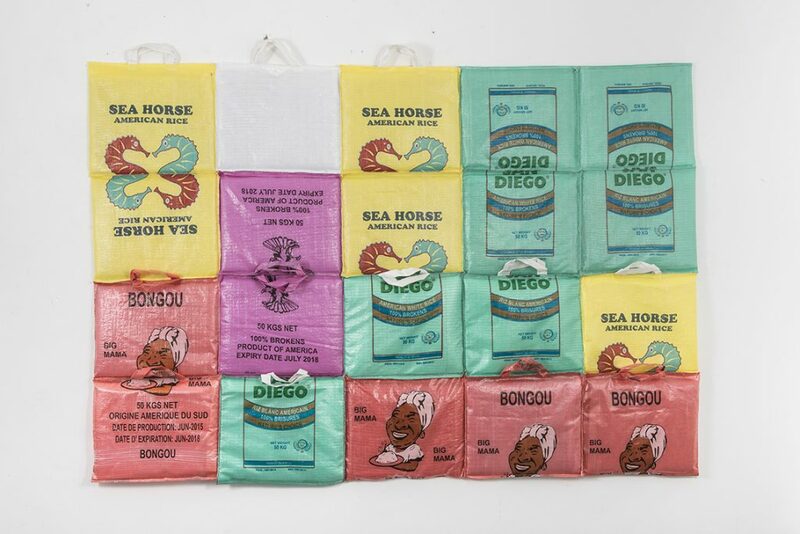 “In the ‘Big Mama’ work, bags once used as supplies transport gains a new layer of meaning when they are grouped together in a large painting, “Penalva says. 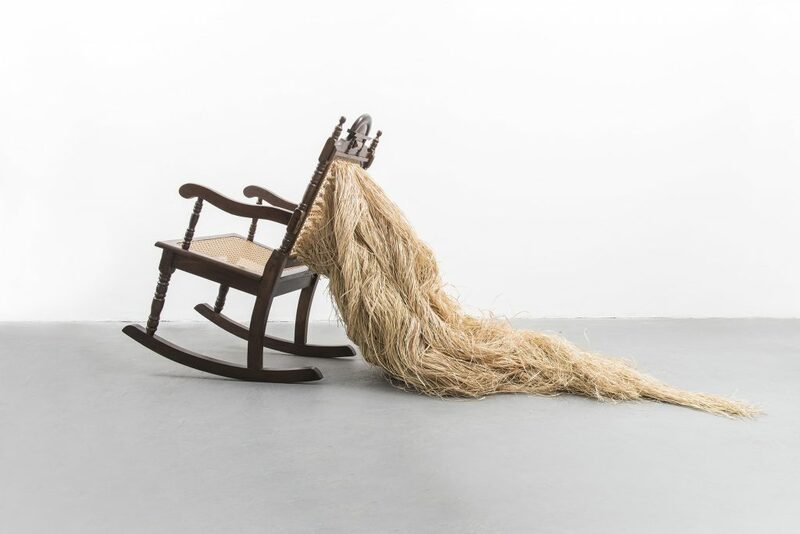 “(…) Being industrial discarded materials, they bring up sustainability. I see these materials as “ink” or things that are in the world and that lack union to form new messages,” he says. Curator Bernando Mosqueira, who wrote the exhibition essay, “Tudo Passa” (Everything Passes), points out that “globalization is the name of the process defined by the exponential increase in international relations on a global scale made possible by technological facilitation of product exchange dynamics and ideas.” I would add one more consideration: If, through globalization, goods began to move increasingly freely across borders, based on trade agreements, these same goods, after been discarded, sail “illegally” from one side of the globe to the other due to the sea currents. Not only goods and ideas were globalized but also their disposal. Items produced in a country commonly settle on the beaches of another.